The other night, while waiting for Triple A to come tow my daughter’s old broken down car, I found myself quite parched and bored and discovered I had my little digital camera. We were under the cranes at the construction site for the NASCAR Hall of Fame. I am not a good Charlottean in that I have never seen a NASCAR race in my life and all I know about them is that I85 becomes a parking lot on race days so I don’t advise anyone to try to get to a funeral in Greensboro on time (since I have already tried that). 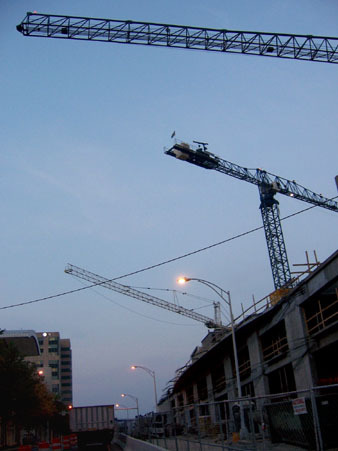 However, I shot up a memory card of these NASCR cranes. ~ by Sandra Lynn Gray on July 25, 2008. I like the line movement in this. Cranes are both fascinating and scary..don’t you think?